The 2010 U.S. Census counted 3.7 million people living in Puerto Rico, a territory of the United States.2 This is down from 3.8 in 2000. The population of Puerto Rico is almost entirely of Hispanic origin. According to the 2010 U.S. Census, the population of Puerto Rico included 3,688,455 Hispanics and 37,334 non-Hispanics. Hispanic origin is based on self-identification by respondents to Census Bureau questionnaires.3 This report focuses on the characteristics of the Hispanic-origin population in Puerto Rico and Hispanics of Puerto Rican-origin living in the 50 U.S. states and the District of Columbia (D.C.). The Hispanic population of Puerto Rican origin in the 50 states and D.C. increased from 3.4 million in 2000 to 4.6 million in 2010. It now surpasses Puerto Rico’s population. Nearly a third of Hispanics of Puerto Rican origin in the 50 states and D.C. were born in Puerto Rico, according an analysis of 2009 American Community Survey data by the Pew Hispanic Center, a project of the Pew Research Center. People born in Puerto Rico are U.S. citizens by birth. But because Puerto Rico, like Guam and the U.S. Virgin Islands, is not part of the 50 states or D.C., those who reside in Puerto Rico are not allowed to vote for President or to elect a voting member of the U.S. Congress.4 Those who move from Puerto Rico to live in the 50 states and the District of Columbia can vote in federal elections. This profile compares the demographic, income, and economic characteristics of Hispanics living in Puerto Rico with the characteristics of Hispanics of Puerto Rican origin living in the 50 states and D.C. as well as with all Hispanics living in the 50 states and D.C. These profiles are based on tabulations of the 2009 Puerto Rico Community Survey and the 2009 American Community Survey by the Pew Hispanic Center. Both surveys provide detailed demographic and economic characteristics that are not available in the 2010 Census. This includes place of birth. Those who move from Puerto Rico to live in the 50 states and the District of Columbia can vote in federal elections. For a statistical profile focused on Puerto Rican-origin Hispanics living in the 50 states and D.C., see the Pew Hispanic Center factsheet Hispanics of Puerto Rican Origin in the United States, 2009. Population. According to the 2009 American Community Survey, there were a total of 8.3 million Hispanics of Puerto Rican origin living in Puerto Rico, the 50 states and D.C. Among those, fewer than half (47%) lived in Puerto Rico. Age. The median age of Hispanics in Puerto Rico is 36, higher than it is for all Hispanics (27) in the 50 states and D.C. and higher than it is for Puerto Rican-origin Hispanics (28) in the 50 states and D.C.
Marital status. Some 37% of Hispanics in Puerto Rico are married, a share equal to that among Puerto Rican-origin Hispanics in the 50 states and D.C. However, both groups are less likely to be married than all Hispanics in the 50 states and D.C. Among them, 45% are married. Educational attainment. More than one-in-five (22%) Hispanics in Puerto Rico have a bachelor’s degree. In contrast, 16% of Puerto Rican-origin Hispanics in the 50 states and D.C. have a college degree. Among all Hispanics in the 50 states and D.C. just 13% have a bachelor’s degree. Income. The median annual personal earnings for Hispanics in Puerto Rico ages 16 and older was $14,400; median earnings for Puerto Rican-origin Hispanics in the 50 states and D.C. was $25,000 and among all Hispanics in the 50 states and D.C. it was $20,000. Poverty status. More than four-in-ten (44%) Hispanics in Puerto Rico live in poverty, a share higher than that among Puerto Rican-origin Hispanics in the 50 states and D.C. who live in poverty (24%) or all Hispanics in the 50 states and D.C. (23%). Health Insurance. Fewer than one-in-ten (8%) Hispanics in Puerto Rico do not have health insurance, a share lower than among Puerto Rican-origin Hispanics living in the 50 states and D.C. (15%) or among all Hispanics living in the 50 states and D.C. (32%). Homeownership. The rate of homeownership (72%) in Puerto Rico is higher than the rate among Puerto Rican-origin Hispanics in the 50 states and D.C. (39%), or all Hispanics in the 50 states and D.C. (48%). The homeownership rate in Puerto Rico is also higher than it is among all Americans (66%). 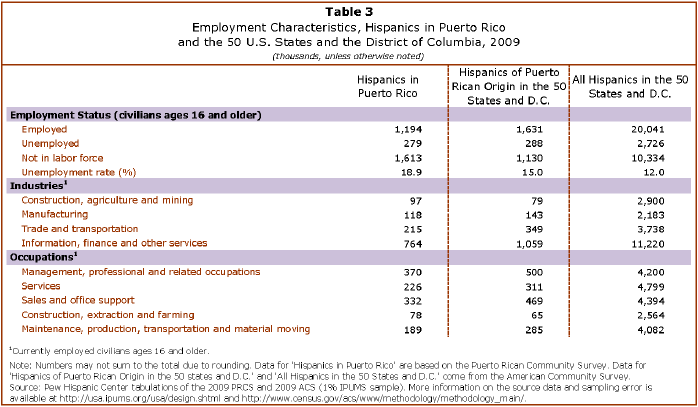 This Demographic Portrait of Puerto Ricans is based on the Census Bureau’s 2009 Puerto Rican Community Survey (PRCS) and American Community Survey (ACS). 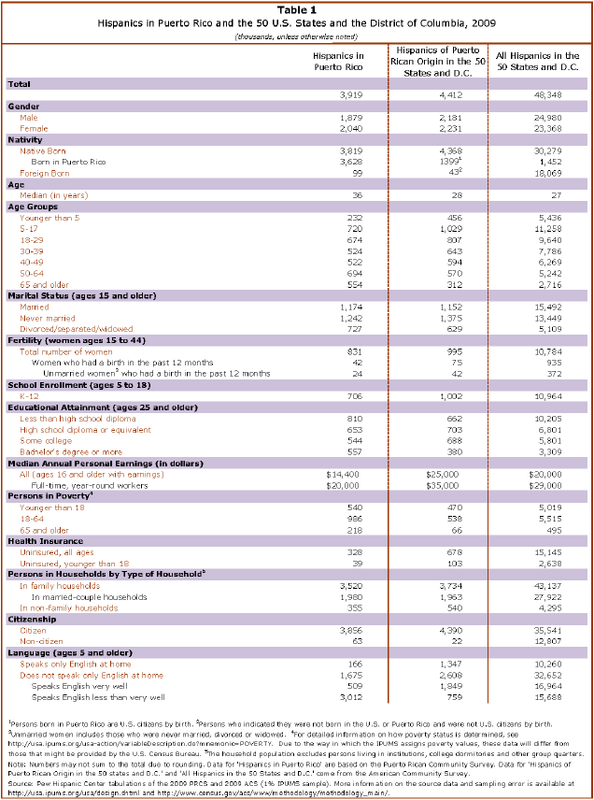 The data used for this statistical profile come from the 2009 PRCS Integrated Public Use Microdata Series (IPUMS), representing a 1% sample of the Puerto Rican population, and the 2009 ACS Integrated Public Use Microdata Series (IPUMS), representing a 1% sample of the U.S. population. Like any survey, estimates from the PRCS and ACS are subject to sampling error and (potentially) measurement error. Information on the PRCS and ACS sampling strategies and associated error is available at http://www.census.gov/acs/www/methodology/methodology_main/. An example of measurement error is that citizenship rates for the foreign born are estimated to be overstated in the Decennial Census and other official surveys, such as the ACS (see Jeffrey Passel. “Growing Share of Immigrants Choosing Naturalization,” Pew Hispanic Center, Washington, D.C. (March 28, 2009)). Finally, estimates from the PRCS and the ACS may differ from the Decennial Census or other Census Bureau surveys due to differences in methodology and data c htollection procedures (see, for example, http://www.census.gov/acs/www/Downloads/methodology/ASA_nelson.pdf, http://www.census.gov/hhes/www/laborfor/laborfactsheet092209.html and http://www.census.gov/hhes/www/poverty/about/datasources/factsheet.html).